Central Mongolia is a picturesque land of rolling green pastures that is virtually treeless. It is sparsely populated by Nomads who shift according to the season. In summer when it is hot, and it rains, they move down to the river flats where the grass is greener, and in winter, when it is cold and dry, they go to the hills where they have shelter from the cold northerly winds. Life has been going on like this since before the time of Genghis Khan and it seems these are people untroubled by the troubles of the world. In the south Mongolia is the Gobi, a dry desert where summer temperatures reach 40c and in winter minus 40, but in the north there are mountains, pine forests, and a mighty flowing river that is one of the world’s great canoe trips. We started our trip on the Eg, a river that begins at the second largest freshwater lake in the world. Khovsgol Lake is the only place Mongolians can go to the beach and in summer it is dotted with campers, but on the day we arrived it was frozen and an icy wind blew cold rain down from Siberia. For canoeing we needed to travel light so we had little spare clothing. We put on everything we had. Our driver, Zogo, wearing only a tee shirt and cotton tracksuit, helped us unload the canoe. With a phrasebook and much waving of hands we understood he wanted to go to the shop. He drove off and we put up the tent. We huddled inside, waiting. After an hour we began to wonder. What, exactly, were we waiting for? Zogo? Maybe we had misunderstood and he was not coming back. What shops were there nearby? In two days and a thousand kilometres with him we had seen only two towns. Even if he did come back how would that make things better? Were we waiting for the weather to change and the lake to melt? How long would that take? We had everything we needed, canoe, paddles, tent, sleeping bag, stove, food for thirty days, and I figured we might as well get started even if it meant walking on the ice for the first bit. We changed into our paddling gear while in the back of my mind I was remembering something about cold and how the brain makes decisions. Outside squalls snapped across the frozen lake. Each squall was a blur of ice, sharp edged and painful. I had nothing on my feet, preferring to keep my shoes and sox dry for the evenings. We sheltered from the wind behind the upturned canoe. I looked at my wooden feet and observed, intelligently I thought, that they were so cold I did not even feel the pain of walking on sharp rocks and that this was a good thing. I looked at my wife next to me. Was it tears in her eyes? Or melting icicles? Had I brought us on something that was beyond us? Maybe when, if, Zogo returns I can ask him to take us home. Give up, go home. Who in their right mind decides that paddling 1200km in a canoe is a good thing to do? We hid again in the tent. Zogo did return, still in his tee shirt. We stood together, my phrasebook words frozen in my memory and I wondered, now that I was in my paddling gear, if I should offer to loan him my very expensive specialist outdoor coat. But Zogo knew better. We were close to the Siberian border and the Russians are experts at surviving the cold, and somewhere in the area he had found an outdoor survival shop. From the car he pulled Russian survival equipment. He poured three paper cups and we raised them to the successful beginning of our trip. Vodka! A second cup and the wind had dropped somewhat. I took off my beanie and gloves. A third cup and it was actually quite warm. I loosened my collar to let the cooling breeze in. What a nice day it had turned into. Far off I saw sun reflecting off snow on the mountain tops. It was very pretty. 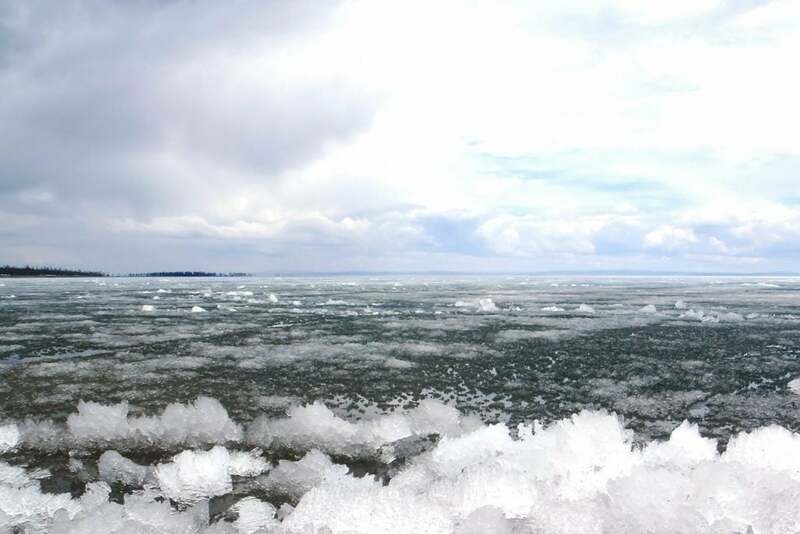 The wind blew ice onto the beach and it tinkled a happy tune. Some geese flew overhead honking and there were some yaks strolling by in their hairy coats. Boy, what a wonderful place. We were going to have a fantastic trip. We dragged the canoe across grass flatlands until there was sufficient river to float, and then we poled the shallows, and then we were afloat and we sang as we paddled. Never had Kerryn paddled so strongly. We were a powerful team, maneuvering around rocks, jumping out at shallows and wading through icy water. Between songs I talked enthusiastically. About the world, about how great she was to do this with me, about the world. She told me to shut up. Our trip had begun. Nothing could stop us now. 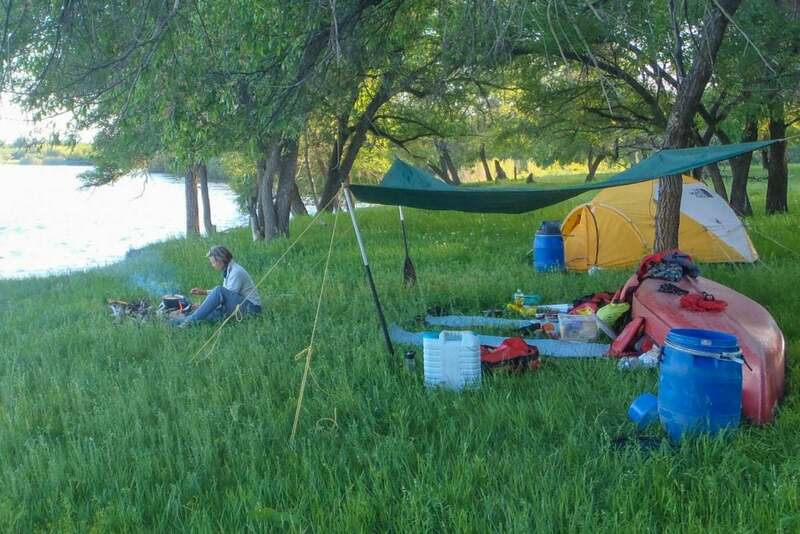 We were alone on the Eg river, paddling between steep forested hills and camping on isolated grassy banks. We gave each night’s campsite a score out of five, one point for ease of landing, distance of carry, flatness of tentspace, the view, and the final point for features such as dry firewood, trees to string up a tarp if it was raining, or a convenient log to lean on. It was not long before we had to expand the system to ten. Many sites scored eleven. Once, we paddled one kilometre from our camp and found another so good we had to stop. We stayed there two nights. The Eg joined the Ur and the flow increased. Gradually the terrain became flatter. In the distance we saw the occasional Gur and nomads moving stock from one pasture to the next. Once, we visited a Gur and drank fermented mares milk, a drink that sounds much better than it tastes. Another time a nomad arrived at our camp on his horse. Our phrasebook explained that the correct greeting when meeting a nomad was to enquire if his goats were fattening up. I motioned for him to sit while I looked up the words for ‘fat’ and ‘goat’. Kerryn produced a plate of dried apples that he ate nervously. I constructed a sentence. He looked at me quizzically. Kerryn made tea. The Mongolians prefer a weak but salty sweet milky tea that resembles the tea Kerryn makes almost exactly, except of course the salt, sweetness and that she likes it strong with only a dash of milk. He looked at it suspiciously. Kerryn pointed to herself and said ‘Osttralee.’ He nodded and pointed at the canoe. 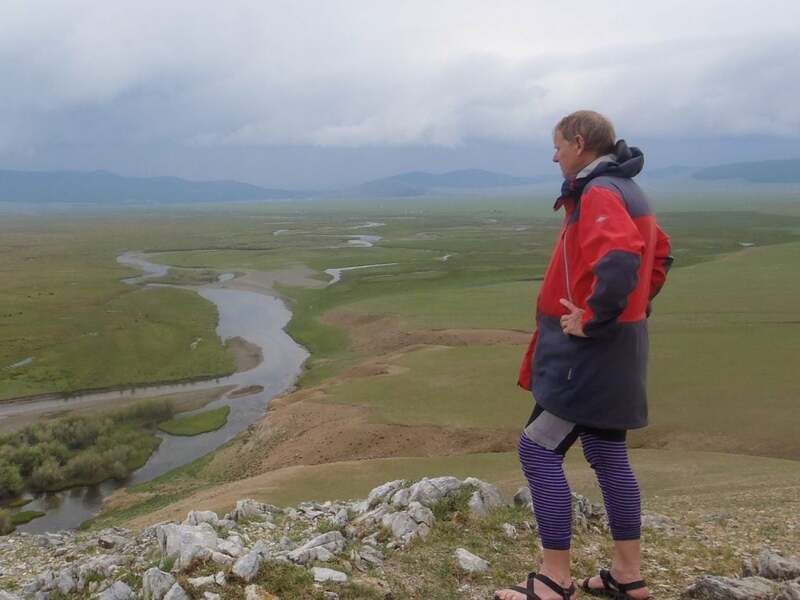 ‘Khovsgol to Baikal,’ Kerryn said. 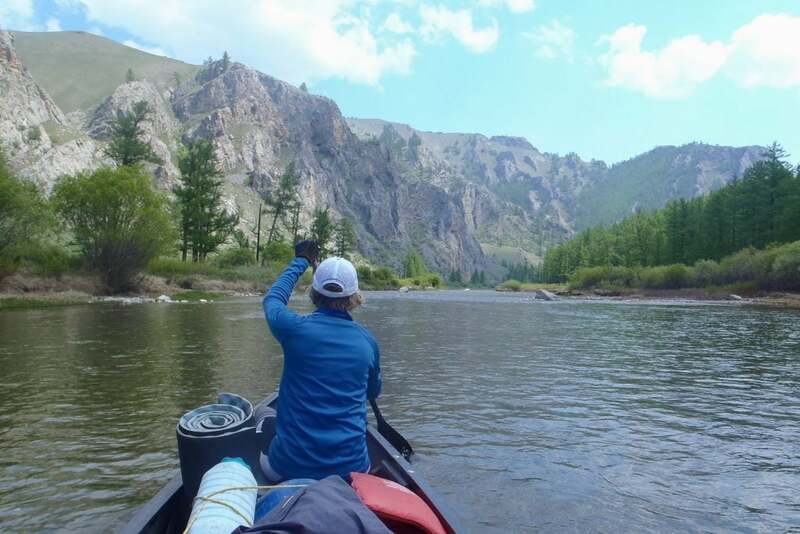 ‘Khovsgol,’ he repeated, and by pointing, asked us which of the two channels heading downstream we would take. I pointed at the deeper one, and he seemed happy with that. It is always good to talk to the locals and get advice about local conditions. I indicated his cup of tea that he had only sipped, but there must have been something urgent with his goats, for he nodded goodbye and rode off. It was only after he was gone that I realised I had no idea how fat his goats were. At the junction with the Selenge the river becomes mighty, a hundred metres wide and fast flowing. We paddled under a bridge. We passed a town un-noticed. Most of the year the river is frozen and of no interest to the town folk, which is to say, the backside of the town pokes into the river. 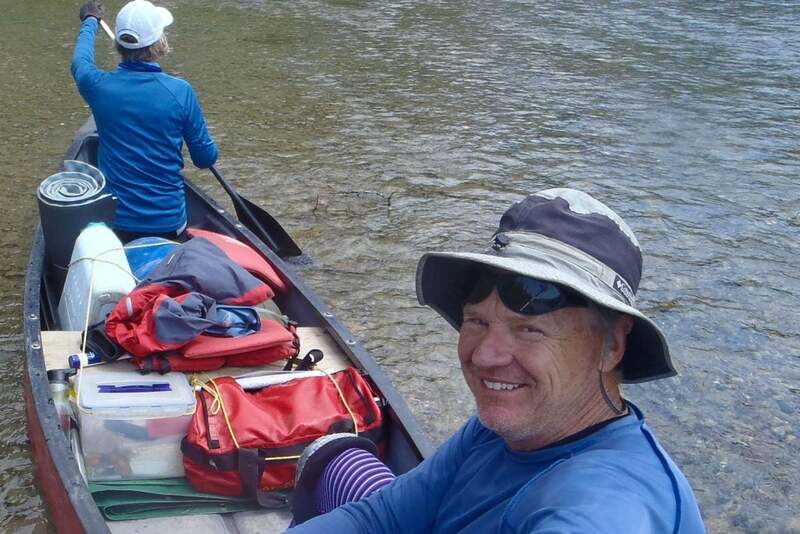 On a canoe trip time is slow and conversations can be unrushed. On this day we took all day to discuss if we should be sterilising our drinking water. Until now we had been simply dipping our cups into the river but seeing the town we thought maybe we should treat it. Then again, how many towns had we not seen, towns away from the river but nonetheless polluting it? And the animals. We must have already seen a thousand flocks of a thousand animals, all of them eating the grass and depositing processed grass on the ground to be washed into the river. If we were not already sick why should we start worrying now? We paddled. We camped. Sometimes there were steep hills, sharp bends, rocky river islands with nesting terns, ducks herding their chicks away, floodplains, wide braided channels or convoluted switchbacks where we lost track of time and direction. The river falls consistently one metre per kilometre and always there was the flow, strong and silent, sweeping around bends and gliding by curious livestock. We do not need to paddle. Float by day, steer to shore each evening. Once, we gave a horseman a ride across the river. He sat in the bottom of the canoe, his arm outstretched to hold onto his horse while it swam alongside trying to get away. After, he galloped along the river. All we could see was the steep bank, a fringe of green pasture, and him, galloping, flying against the sky. At the Russian border the Selenge joins the Orkhon. We could have paddled on, crossed the border illegally, but the Russians are bit funny about their border. 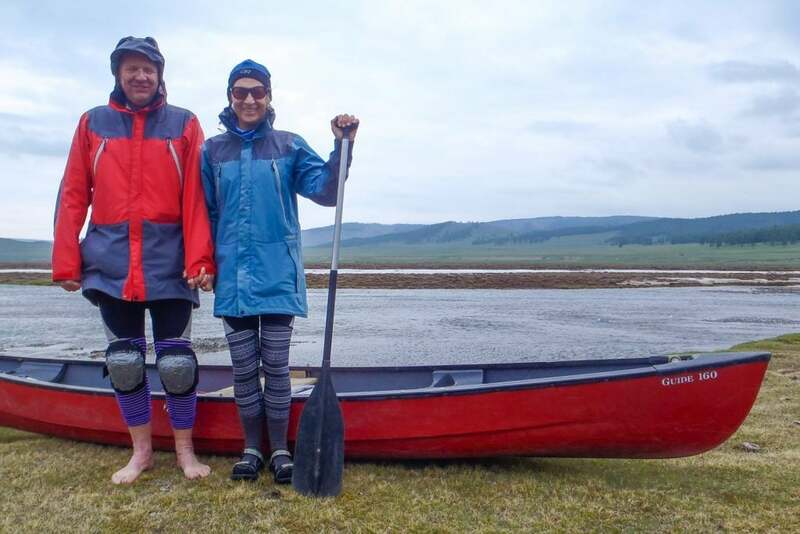 They are also a bit funny about unsupervised foreigners in their country so we paddled upstream on the Orkhon to a town where we met Ernst and Darima who would be our guides in Russia. In my opinion the best travel is slow travel and a canoe expedition is one of the slowest. 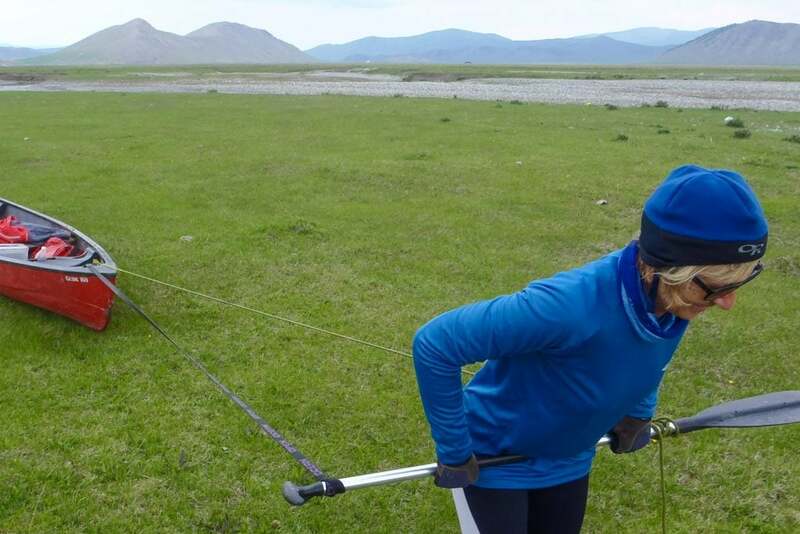 But that is nothing compared to the pace of crossing the one kilometre no-man’s-land between Mongolia and Russia. We sat in the minibus and waited. Others stood swapping cigarettes and drinking cups of salt sweet tea that a lady was selling from a thermos. In the distance I could see guard towers and twin razor wire fences. Uniformed men armed with AK47’s patrolled and others with mirrors on sticks stood nearby. We waited. Later, we are on the same river. It is the same valley. It is the same paddle carving the same path through the water. 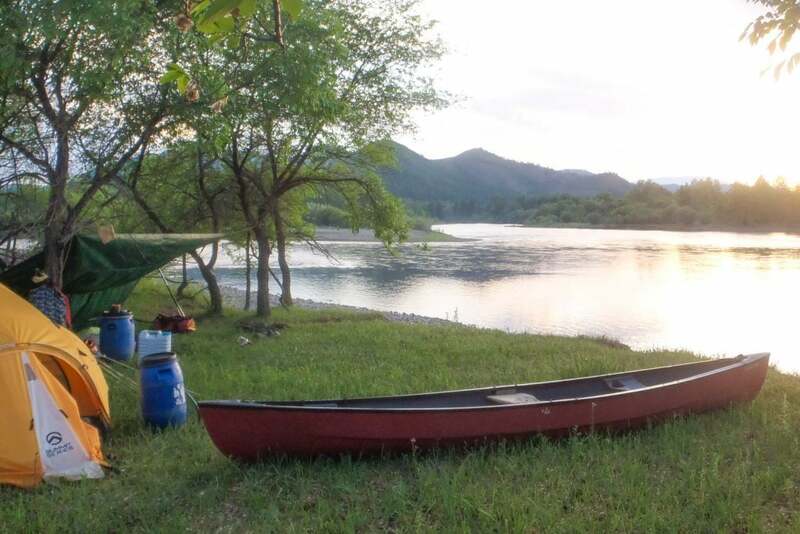 The border makes no sense to someone who has spent three slow weeks in a canoe. Darima told us of the tea trade and how the town of Kapta was once one of the wealthiest cities in Russia. We visited the museum and the exhibit that moved me was the wartime posters. One, in colour and layout and intent, was exactly the same as ‘Uncle Sam needs you’. At Ulan Ude we stopped to resupply. Ernst and Darima walked to the shops while we guarded the canoes. The signs of civilisation – theft, and shopping centres! Is the world the same all over? Is this the real world? Further downstream we walked to an abandoned cathedral that seen from the river was majestic, inside, nothing but twisted metal and fallen rubble for in the 1950’s the Soviets blew it up. We saw nearby remains of buildings, chimneys, walls, and a German tank that turned out to be cardboard props of a movie set. The real world is the one where we blow up cathedrals because we don’t like the religion. We visited a war memorial, each family in the town had a dozen names on the plaque. The real world, fighting because, why? They drink their tea funny? The world is the same all over, and all mothers grieve, and I am thinking: history is a river. Today, somewhere, someone is blowing up a church. Do we go with the flow or do we resist? After 30 days we arrive at the Selenge delta where weeds and reeds and mud channels wait to confuse a canoeist. Ernst says ‘Go with the flow,’ and then we are on Baikal, more an ocean than a lake. We had made it. We drank a second bottle of vodka. Martin Chambers wrote the Canoe and Kayak guide to Western Australia. 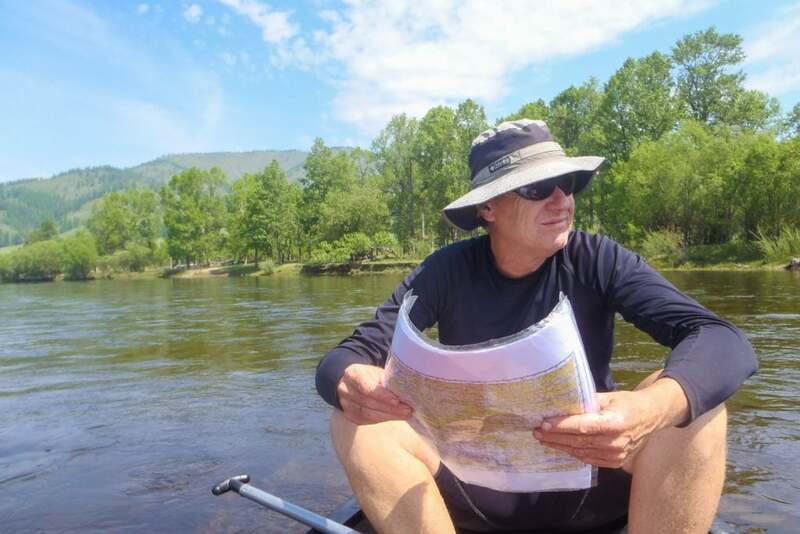 He has been a paddler all his life and last year he and his wife Kerryn paddled a 30 day canoe descent of the Eg river in Mongolia, their second canoe expedition in that country. Martin lives in Perth and writes full time. His latest novel ‘How I became the Mr Big of People Smuggling’ was shortlisted for the TAG Hungerford award and was published in June 2014 by Fremantle Press. The judges said the book gave the uncanny feeling that it could all be true.